Private Club Marketing with Google Ads? I use Google every day for so many reasons. In fact, as of 1.13pm today I have already been on Google Images, Maps, Mail, and search results. I’m so dependent on Google that I wouldn’t know what to do without it. It’s a great tool for a consumer, but also a great tool for a golf club. When we do any private club consulting work one of the first things we do naturally, is Google the client club; What is the first search result that pops up? What reviews show on the search pages? Are the images relevant? Do they have a business bio? You’d be surprised at how much of a first impression these simple results can make. This is also the first thing a prospective member will see so you want things to look right. 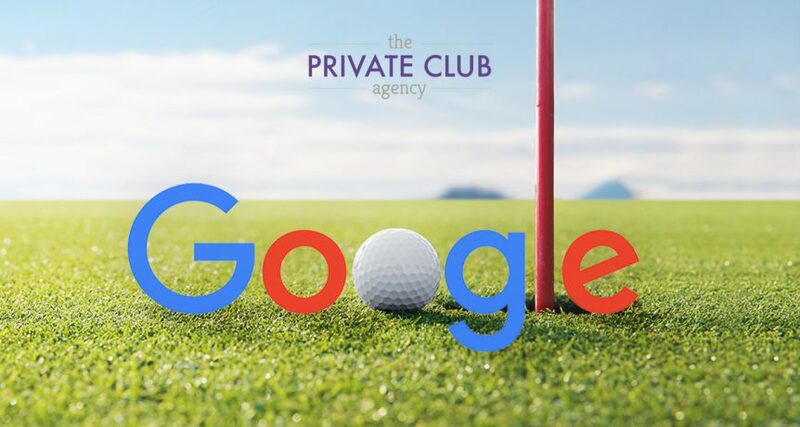 If we go beyond simple searching, we can see the power of Google for advertising your golf marketing efforts; I bet if you search your own golf club, chances are that some advertised search results will appear alongside you. Most of the time it will be a tee time booking site or maybe a competitor, but this deters prospects from your website and golf course. There’s nothing to stop you from getting involved with some paid search advertising either. Granted, the private club industry has a stigma of being exclusive and by nature, private. But private club marketing can be aligned with these principles; you have complete control over all aspects of a Google ad, from the content, any extra links, keywords associated with your ad, to allocating exact times you want your ad to show. But with just a little work you can get an ad running to send prospects to your golf club. 1.) Have an objective- You want to have a purpose to your advertisement. Above is the suggested keyword report. The more keywords you enter the more relevant the suggestions will become. This is the plan forecast; it gives a few key metrics that can help you conceptualize the typical costs and how many results you could expect. 3.) Export the plan and create your ads – There is no limit on how many ads you can create! Try a few variations here with different calls to action, different text in the body etc. 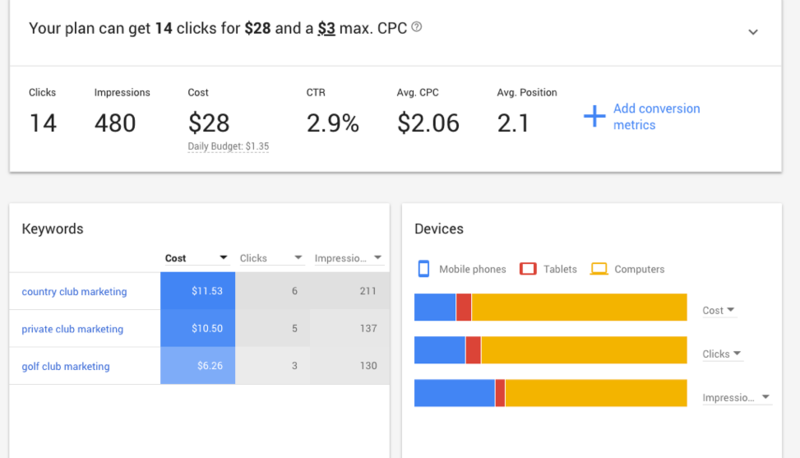 The logic to this is that Google will optimize to show the best ads once running. You can also add phone numbers, location extensions, and structured snippets. We recommend using as many extensions as you can since it all provides more interaction opportunities with a customer. 5.) Set your location targeting – You can get really specific here with zip codes, towns, cities, counties, as well as doing radius targeting. For a typical private club, we would look at a radius no more than 15 miles from the club’s location. Once you have all of these steps taken care of you’ll be ready to launch. One of the great things is that you can set any budget, adjust it instantly, and stop campaigns immediately. Google ads are certainly worth experimenting with for private club marketing efforts. Try for yourself, and if you have any questions contact the Private Club Agency, and we can take your Google campaigns to the next level. Find out how we can help you save time, resources and money while building your membership.